I met Fen Fen for the first time yesterday, as a fellow adjudicator for the Sabah State Level Choral Speaking Competition for Primary Schools at Sandakan Hotel, Sandakan. After the event, she passed around some books to some teachers around her, me included. "Are you teaching Form 4?" I remembered her asking. I explained that I'm actually teaching in a primary school. She didn't push the subject much further when she learned that, but her book caught my attention. It looked vaguely familiar. "I think I saw it on Facebook," I quipped, and Fen Fen brightened up immediately. "Yes, I asked my husband to post it on Facebook for me," she said. Then I learned that Fen Fen is actually Perry Lim's wife (Perry Lim is a fellow member of Sabah English Language Teachers Group). I have seen the book being advertised by Perry Lim on the Sabah English Language Teachers group on Facebook. I remember being impressed by it, and by the teacher who has worked on it, and now there she was, right in front of me. I bought the book, Fen Fen sold it to me for RM5. I felt the urge to share Fen Fen's effort with everyone, because I think what she has done is greatly impressive. 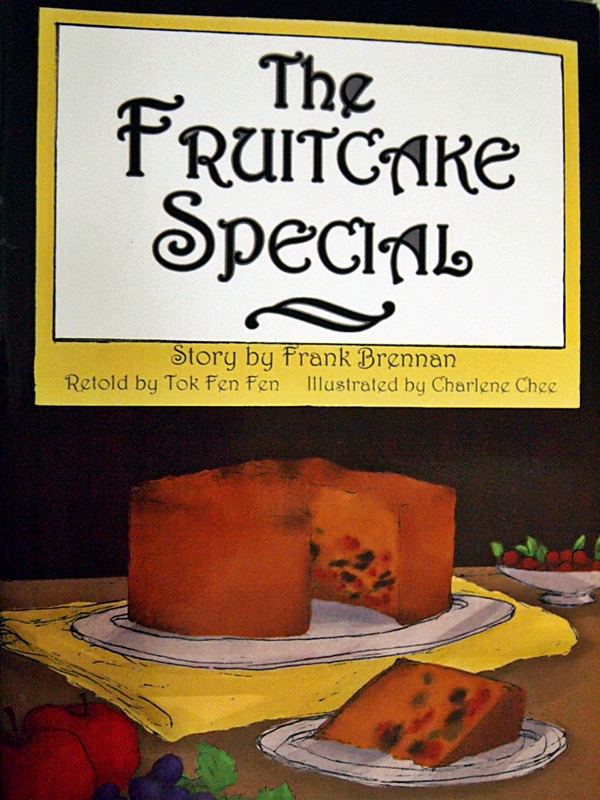 The KBSM syllabus for Form 4 Literature Component includes a short story by Frank Brennan entitled 'The Fruitcake Special'. 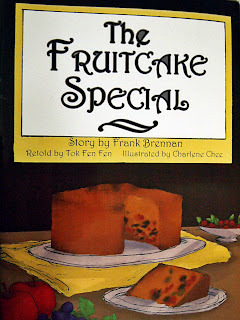 It is actually one of the stories in Brennan's collection of short stories published under the title 'The Fruitcake Special and Other Stories' by Cambridge University Press. Fen Fen has retold the story, making it simpler, then worked together with one of her Form 4 students, Charlene Chee. 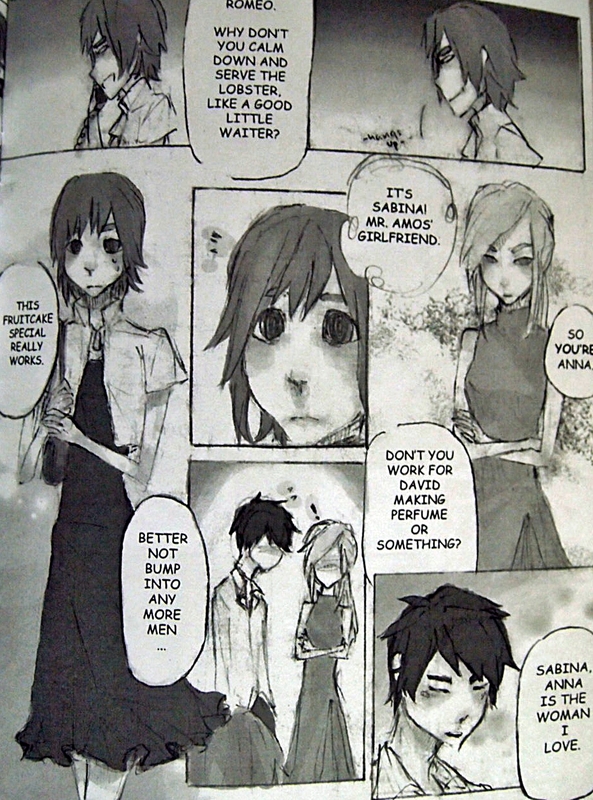 Together, they have turned it into some sort like a comic/anime/manga book. The objectives of doing so, among others, are to help her Form 4 students understand the story better and to attract their interest in learning the literature. 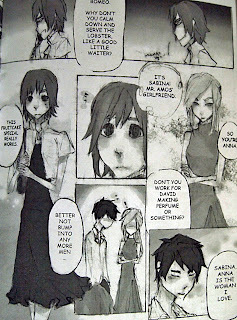 Charlene Chee, Fen Fen's student who has done all the illustrations in the book is clearly a very talented artist. She has drawn the characters and the scenes in the story in anime-style illustrations, making the book resemble one of those Japanese-manga comic books that are so popular among teenagers her age.Using her own fund, Fen Fen has printed and self-published the book. For ordering details, pricing and etc, please contact Fen Fen at tokfenfen@yahoo.com, or you may also send a message to Perry Lim through his Facebook here: Perry Lim's Facebook. I totally agree with you on this one. A tool like this will definitely break the monotony of a classroom routine and help students break through to the meat of a story. When I read this book, I was pulled most irresistibly into the story by the well-planned panels of each stage of the tale and the skilled illustration of characters. The artist is most adept at conveying emotions with just a squiggle or a stroke. Having left the school environment just before the introduction of this book, I had no previous knowledge of the story. But after ten minutes of this book, the story is now etched into my brain :) Kudos to both Tok Fen Fen and Charlene Chee! I'm very much into the use of tools (as opposed to just 2D words on a page) in my teaching. Even if it's just colourful paper and scissors. While I love reading myself, 8 years of teaching in a boys' school taught me that not everyone likes to wade through a river of words just to understand a story or a concept. This is new to me. Will get a book from Fen or Perry. Good to share with my colleagues who teach English in school. Chegu Carol, you should! Hehe. Especially if you're teaching Form 4 or Form 5.